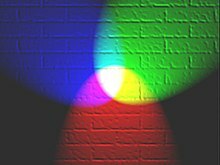 Red, green, and blue lights combining by reflecting from a white wall: adding red to green yields yellow; adding all three primary colors together yields white. Additive color models are applied in the design and testing of electronic displays that are used to render realistic images containing diverse sets of color using phosphors that emit light of a limited set of primary colors. Examination with a sufficiently powerful magnifying lens will reveal that each pixel in CRT, LCD, and most other types of color video displays is composed of red, green, and blue light emitting phosphors which appear as a variety of single colors when viewed from a normal distance. Additive color does not, alone, predict the appearance of mixtures of printed color inks, dye layers in typical color photographs on film or paint mixtures. Subtractive color, is used to model the appearance of color (absorbing) from pigments or dyes, such as those in paints, inks, and the three dye layers in typical color photographs on film. The combination of two of the common three additive primary colors in equal proportions produces an additive secondary color—cyan, magenta or yellow. Additive color is also used to predict colors from overlapping projected colored lights often used in theatrical lighting for plays, concerts, circus shows, and night clubs. The full gamut of color available in any additive color system is defined by all the possible combinations of all the possible luminosities of each primary color in that system. In chromaticity space, the gamut is a plane convex polygon with corners at the primaries. For three primaries, it is a triangle. 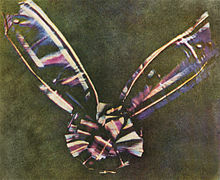 The first permanent color photograph, taken by Thomas Sutton, under the direction of James Clerk Maxwell in 1861. Systems of additive color are motivated by the Young–Helmholtz theory of trichromatic color vision, which was articulated around 1850 by Hermann von Helmholtz, based on earlier work by Thomas Young. For his experimental work on the subject, James Clerk Maxwell is sometimes credited as being the father of additive color. He had the photographer Thomas Sutton photograph a tartan ribbon on black-and-white film three times, first with a red, then green, then blue color filter over the lens. The three black-and-white images were developed and then projected onto a screen with three different projectors, each equipped with the corresponding red, green, or blue color filter used to take its image. When brought into alignment, the three images (a black-and-red image, a black-and-green image and a black-and-blue image) formed a full color image, thus demonstrating the principles of additive color. ^ MacEvoy, Bruce. "handprint : colormaking attributes". www.handprint.com. Retrieved 26 February 2019. ^ David Briggs (2007). "The Dimensions of Color". Archived from the original on 2015-09-28. Retrieved 2011-11-23. ^ "James Clerk Maxwell". Inventor's Hall of Fame, Rochester Institute of Technology Center for Imaging Science. Archived from the original on 2010-09-18. ^ Robert Hirsch (2004). Exploring Colour Photography: A Complete Guide. Laurence King Publishing. ISBN 1-85669-420-8. Archived from the original on 2017-02-25. This page was last edited on 12 April 2019, at 01:08 (UTC).